India is rich with affluence of honeymoon destinations and Kalimpong is one such destination situated in West Bengal that can be reached by covering an altitude of 1250 meters. 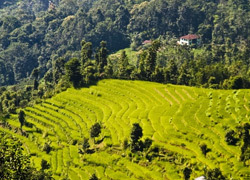 Therefore, having honeymoon in Kalimpong would definitely be full of loads of excitement and merriment. The tint of Buddhism is greatly apparent in Kalimpong since as you roam around this hill station, you come across profusion of sacred Buddhist monasteries and gompas. Adventure enthusiasts become all the more sporty when they practice hiking as well as river rafting in River Teesta of Kalimpong. Couples also get a chance to visit churches, museums and at the same time they can switch to shopping and drool over the amazing food of Kalimpong restaurants. Moreover, accommodation options provided by Kalimpong honeymoon packages are also more than comfortable. And in terms of tourist attractions and other places of interest, Kalimpong remains to be a nirvana for all those who plan Kalimpong honeymoon tours. Among the various Buddhist monasteries of Kalimpong, you have the Tongsa Gompa, which is well known for being quite old as it belongs to the late 17th century. Apart from this monastery, you can also spot the Tharpa Choling Monastery that came into existence in the year 1937. Moreover, you can also make it a point to visit the Zong Dog Palri Fo-Brang Monastery that tickles your fancy through its beautiful wall paintings that delineate the innate Tibetan artistic style. Adding to the list of monasteries and museums, you also have the amazing Lepcha Museum and Monastery, which quite nicely delineates the innately rich culture and lifestyle of the Lepcha community. One finds manuscripts as well as various apparatus belonging to the Lepcha community. These monasteries of Kalimpong do a lot in amusing people as they come for their honeymoon in Kalimpong. Other things to do while being on your Kalimgpong honeymoon tours are paying a visit to the Neora Valley National Park that was founded in the year 1986. The park consists of exceptionally rich wildlife and biological diversity in the form of Himalayan black bear, tiger, red panda, wild dog, etc. And if you both want to experience the natural luxury of being in the middle of mountains and hills, then you both must turn your way towards the Durpin Dara Hill. You both would definitely be taken aback by the mind boggling sight of the Kanchenjunga Peak, River Rangeet, River Teesta, as well as the enchanting tea estates such as the Lopchu Tea Estate as well as the Peshoke Tea Estate. The entire scenery is likely to make you completely awe struck. Other beautiful places for India Honeymoon Packages is captivating flower nurseries. The nurseries of Kalimpong are best honeymoon places in Kalimpong and plethora of flower variety including lilies, dahlias, cacti, roses, amaryllis, etc. In addition to this, there are places such as Dr Graham’s Home, the Roman Catholic Church, St. Therasa Church, Teesta Bazaar for diehard shoppers, etc. All these places form an important part of you Kalimpong holiday packages for honeymoon. MAP: With breakfast & Lunch or Dinner. AP: With breakfast, Lunch & Dinner. Airport & railway station pick-up and drop. From 25th Nov 2011-21st Dec 2011/2nd Jan 2012 - 15th Mar 2012.